The 3rd version of Broc Raiford‘s signature Vessel frame from Volume Bikes has arrived. Here’s a short but sweet promo with a clip from Broc followed by a bunch of detailed shots of the frame! Take a look! 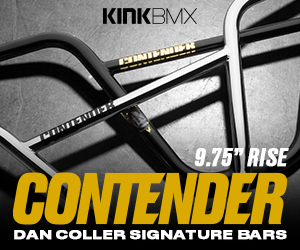 “The new and updated Broc Raiford Signature Vessel Frame. Comes in Chrome and Raw/Black Splatter, with hand drawn graphics from the man himself. Volume Bikes coming through with some fresh heat from Broc Raiford! It’s always a good day when there’s a new Broc Raiford video to check out! Volume Bikes just released this new one featuring Broc getting down on street spots out in California. Believe it or not, these are just leftover clips that won’t be in a DVD part that he’s working on, which goes to show just how good Broc is on a bike since we would have had no idea had it not been in the description below. Hit that play button and take it all in! “In the midst of a busy year for Broc, filming for his Disco Stew DVD part, he managed to come away with a quite dialed timeline of “Leftover” footage. Whatever you may consider this batch of clips, leftover or not, its still a really good example of having fun and using spots in a unique and “Broc like” approach… Enjoy! Spend a day cruising with Broc Raiford and Jarren Barboza as they work on a few video projects! Here’s a raw, behind the scenes look at a full day of filming at different spots with Broc Raiford and Jarren Barboza as they put in work for a few different video projects. This gives you a raw behind the scenes look that went on throughout the day, plus some leftover clips that won’t be getting used in the videos.